What is a LOHR maintenance contract? The guarantee of optimum operation for the entire duration of the contract. LOHR maintenance is made for you! 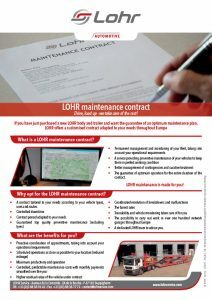 Why opt for the LOHR maintenance contract? A contract tailored to your needs according to your vehicle types, uses and routes. A dedicated LOHR team to advise you. Higher residual value of the vehicle under contract.